Now you can buy a vinyl record of complete silence | What Hi-Fi? Unless you've been living under a rock these last few years, you'll have noticed that vinyl has undergone something of a resurgence. Whether it be trendy teenagers buying records in Urban Outfitters (which may never be played) or more mature punters dusting off their old decks, vinyl sales have reached new heights. With that fresh popularity, comes all sorts of new opportunities and indeed opportunists, such as this completely silent record. 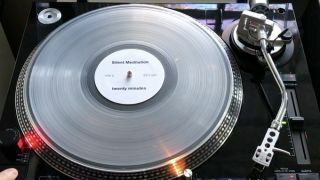 Silent Meditation is a record pressed on clear vinyl, complete with two sides of grooves, each containing 20 minutes of complete silence. The project is hosted on Kickstarter and has already well-exceeded its goal - showing yet again the enduring appeal of pressed plastic, even if there isn't any music on it. "You can use it for meditation or put it on whenever you want to enjoy twenty minutes of silence," goes the sales pitch, which, while largely tongue-in-cheek, does suggest a physical trigger is no bad thing for anyone who enjoys meditation or wants to give it a try. As father and son creators, Eric and Ben, explain: "This a serious project, and in its seriousness we also hope it creates some levity. The record is a reminder that silence is valuable, and it can be enjoyed. To purchase a record and play a silent meditation is intentionally humorous. Silence, like meditation, can feel severe, even punitive. Having a silent record might remind you that's not always the case." That being said, they're definitely not taking themselves too seriously: "Note: this does not require a record player to be fully enjoyed. Technically, it doesn’t even require this record." They're not the first 'artists' to experiment with silent music, with Erwin Schulhoff, Raymond Scott and John Cage just some of the composers who have written silent compositions. And it's not the first such vinyl release; The Wit and Wisdom of Ronald Reagan was a satirical LP issued by Stiff Records in 1980, complete with multiple tracks of complete silence.